Nov. 25, 2008, 11:17 a.m.
By Zachary M. Seward @zseward Nov. 25, 2008, 11:17 a.m. 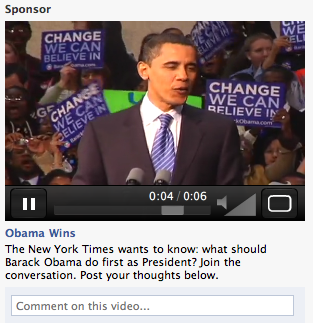 The New York Times is happy to be your Facebook friend. An internal memo yesterday from Times president Scott Heekin-Canedy touted the newspaper’s “successful” advertising campaign on Facebook in the days following the presidential election. The goals of the campaign were to increase our number of Facebook fans; raise awareness of NYTimes.com as an interactive news center; and engage the Facebook community in a conversation about the election outcome. We increased our number of fans more than three times in just 24 hours — from 49,000 to 164,000 — and in the process far exceeded our 2008 goal of 100,000 fans…Possibly the greatest success of this campaign, however, is that our fans continue to rapidly grow…into a powerful, free word-of-mouth network that we will leverage for future marketing messages. According to Heekin-Canedy, the Times netted “4.3 times the value of our spend” on the ad campaign, though it’s unclear how that figure was calculated. In any event, it’s clear the Times is sold on the oft-debated marketing value of Facebook and now stands far ahead of other newspapers in building a presence on the site. The NYT’s page is not a great place to read the news, at least not yet, but there are some videos, a news quiz, and other features. The wall, with its off-topic notes and random musings, is kind of the digital equivalent of a newspaper’s margins. There are at least nine other Times pages on Facebook, featuring sections of the paper — T Magazine (1,488 fans), Modern Love (71 fans) — and writers Mark Bittman (334 fans) and Nicholas Kristof(20,631 fans). I’ve also noticed some Times reporters, including City Room bureau chief Sewell Chan and reporter/blogger Jennifer Lee using the site more heavily in recent months. (Step it up, Jenny! Sewell has more friends than you now — 2,166 to 1,730.) Perhaps even more importantly, fans of Times features like obituaries and the crossword have started Facebook pages without any apparent encouragement from the newspaper. I read All Facebook for reporting on the social networking site’s marketing potential, but I don’t have a grasp on the value of Facebook pages and ads. This campaign by the Times seems valuable, but I’m relying on an account from within the company. At the very least, it shows some foresight by the Times Company in recognizing the marketing opportunity of Obama’s victory. Stuart Elliott reported Sunday that the Times had sold between $1 million and $2 million of Obama-related merchandise and reprints of the paper’s Nov. 5 front page. Year-to-date results in the financial services category as of September show that, despite significant losses from a number of key accounts, the financial team is up in print dollars, for three main reasons — the market response to the financial crisis; advertisers who took advantage of the immediacy of our newspaper to reassure their customers and to gain customers who were disenfranchised from their own banks; and readers’ ability to get cash through CD and account offers. Another factor, of course, is our trusted brand in a time when people do not have trust. Digital advertising is also experiencing strong growth in the category. You can see the whole eight-page memo right here. POSTED Nov. 25, 2008, 11:17 a.m.
Seward, Zachary M.. "NYT sees success in Facebook push." Nieman Journalism Lab. Nieman Foundation for Journalism at Harvard, 25 Nov. 2008. Web. 24 Apr. 2019. Seward, Zachary M.. "NYT sees success in Facebook push." Nieman Journalism Lab. Last modified November 25, 2008. Accessed April 24, 2019. https://www.niemanlab.org/2008/11/nyt-claims-success-in-facebook-push/.